This winter and spring steelhead season was one sent down by the Steelhead Gods in Northern Michigan. Mild weather and rain spread throughout the season provided pushes of fish sporadically stretched from the fall until now. It wasn’t a record year for numbers, but there was always enough fish to keep anglers interested and great fishing at times. Meanwhile, one thing is for sure; this season was much better than last year. Although we had a mild winter it seems to be extending longer than expected with several recent snowstorms and cold snaps. Although it’s not desirable spring weather its benefiting steelheaders. The recent wintry conditions have kept water temperatures from rising, which will likely extend our season two-to-four weeks. I’m expecting steelhead to be available in Northern Michigan through April. Whether or not they remain into May depends on water temperatures. As soon as the water warms the steelhead will migrate back into Lake Michigan. The Manistee area has always been my favorite destination in Northern Michigan for steelhead and also the most well known. Although the Big Manistee River is famous, too, there are also several feeder streams to Manistee Lake and the Big Manistee River that yield phenomenal spring steelhead fishing. In fact, the entire region boasts steelhead. On the other hand, during the spring steelhead have one thing on their mind. Their goal is to shoot upriver and spawn. 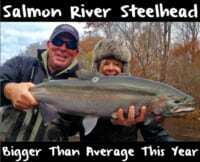 Once water temperatures rise into the mid 40s steelhead blast through lower/mid stretches without stopping. I’ve had many great spring days while fishing 15-50 miles upstream of the lake where we’ll catch dime-bright steelhead that haven’t been in the system for more than a couple days. During the spring I’ll generally target the upper stretch of our river system, mainly the short and fast pockets and larger holes. Although I’ll never fish for steelhead while they are on their beds I’ll fish the holes in the vicinity. I focus most of my time on the Manistee system, but there are an endless amount of streams across the region that yield phenomenal steelhead fishing. Some of the best include the Grand, White, Rouge, Muskegon, Pere Marquette, Betsie, Au Sable and Boardman. As I’ve mentioned in recent blogs, it’s hard for me to find a method that produces better than float fishing fresh steelhead spawn cured in BorX o Fire. 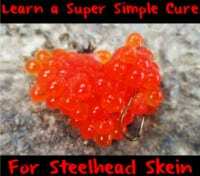 To learn how I cure spawn please see my recent how-to blog: https://www.pautzke.com/learn-to-float-fish-steelhead-spawn-for-great-lakes-spring-steelhead. There are times when beads, jigs/wax worms, wigglers, crawlers and spinners produce best as well. Therefore, it’s important to hit the water with a variety of baits to dial in the bite that can change by the hour in the spring. Our Northern Michigan steelhead run remains in full swing. It’s been a good year for numbers and fishable weather. Although many fish have begun spawning, there will be plenty of opportunities for fresh, spawning and drop back steelhead for the next few weeks. Fortunately there are enough steelhead in our streams to satisfy anglers now so get out and get bit!